One Saturday night my husband and I saw the movie Hacksaw Ridge. It was a compromise, believe me. Hubby prefers slapstick stuff or films with lots of action, and I adore sad movies. We figured this movie would be both exciting and sad. connected it to the craft of writing. Of course. As usual. I think as writers, we think everything can serve as a writing lesson, that everything revolves around us as writers because the whole world revolves around the opposite of us. As authors, we're not the axis of anything. We're never the center of the universe for even a millisecond because of all the rejection we get. So, forgive me if I watch a film and draw some lines between the movie and my craft. 1. Be ready to kick it or slap stuff out of the way. The moment (one of many) that prompted this post was when a couple of hand grenades were lobbed toward Andrew Garfield/Desmond Doss. He immediately kicked one back toward the enemy and slapped the other one back, like it was a volleyball. There are times when someone (perhaps a family member who's an idiot not well-versed in the art of writing) says something stupid. Something like, "Why don't you just give up on that book you're working on?" or "It must not be any good, 'cause if it was, it'd be on in Barnes and Noble by now." Or "Writing's easy. Look how many books James Patterson puts out every year." When that kind of grenade is tossed your way, don't even think about it. Kick it away from you. Send it back their way, even if it you only mumble the colorful response in your head. 2. Stay true to yourself. 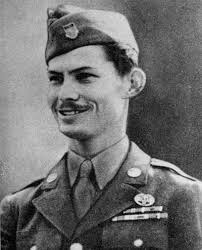 The real man behind the movie, Desmond Doss, never strayed from his convictions. He didn't believe in killing a person, and went onto the battlefield without a gun. Stay to your course. If you are convinced you have a story to tell, write it, revise and edit it, and then work on getting it published. Don't let small obstacles prevent you from moving forward. 3. Keep telling yourself, "Just one more." Desmond Doss, in spite of being exhausted, would tell himself, "Just one more," and then all by himself would lower another wounded soldier down to the bottom of a cliff, so the injured soldier could be driven away from the battle to the medical tent. As a writer, there are times when I get feeling downtrodden. My manuscript has been rejected by an editor? Just send it out to one more editor, I need to tell myself. My manuscript has been rejected a bunch of times, making me feel like a total failure? I need to prod myself with Just start one more project. So how about you? What movie or TV show can you connect to your writing? Or, what nimroddy mistaken thing has a friend or family member said to you about writing? Sioux Roslawski is a middle-school teacher (after discovering that retirement was not for her), is a freelance writer (she has stories in 15 Chicken Soup for the Soul books), belongs to two writing critique groups and rescues dogs for Love a Golden Rescue. She's also a mother to two, a grammy to one extremely talented fifth grader, and a future mother-in-law to a lovely bride-to-be. To read more of Sioux's musings, go to Sioux's Page. Sioux, I just saw this movie a few weeks ago and loved it! Desmond Doss is a real hero. You make some great points relating writing to the movie. Stay true to your convictions was the takeaway I also received. I will get back to you on the movie/writing connection! You've inspired me to look at non-writing movies in a writerly way. I have recently been watching Mad Men on Netflix and the writing is outstanding. I enjoy the show for many levels, but that is definitely one reason why I am watching it. The last movie I saw was Fist Fight. Which probably tells you all you need to know about my taste in movies. I would recommend that we, as writers, never resort to drastic measures and chop up our manuscripts when things aren't working out (like Ice Cube in this movie, taking a hatchet to a student's cell phone). Look at the big picture. You may regret your hasty actions later. Sleep on it. Consider less drastic options. Okay. Not such great movie-inspired advice. But I really enjoyed Fist Fight. Hacksaw Ridge is at the top of my "to see" list. My sister saw it and told me how great it was--our dad fought in the Pacific and the movie mentions the infantry division he was in. Isn't it wonderful how writers can relate almost anything to writing? Another great post, Sioux. Sorry it took me a few days to catch up with my Muffin favorites. After your glowing review of "Hacksaw Ridge," I had to go watch the trailer. Normally I shy away from war movies, but this one has Andrew Garfield in it and looks phenomenal so I'll probably be okay! Every time I watch "Dead Poet's Society," I get fired up about writing all over again. I also remember how much I love poetry from the Romantic Period. I feel lucky that I've always been able to write without too many family members telling me I'm wasting my time. A few years ago, my grandfather said to me that "maybe one day I'll get published," and I had to calmly explain to him that although I haven't published a book, I do make money from my writing!